Produced with advantage technology, the 50-55HP wheeled tractor has passed E-Mark certification. As a professional Chinese wheeled tractor supplier, our company has the self-owned brand for the 4 cylinder diesel engine, which features large torque reserve factor, strong power, and high economic efficiency. 1. 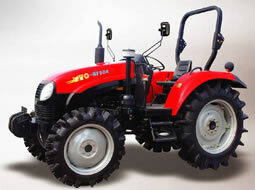 The heavy duty tractor is manufactured with reliable and durable transmission. So, it is quite suitable for the operation with heavy load. Moreover, the shuttle shift structure of the transmission system makes for high working efficiency. 2. There is integrated axle housing provided for the front drive axle for big load bearing capacity. The outstanding sealing property effectively prevents the drive axle from being damaged. 3. Our 50-55HP wheeled tractor can be equipped with clutch pedal for safe startup. So, accident caused by incorrect startup can be avoided.